We’d love your help. 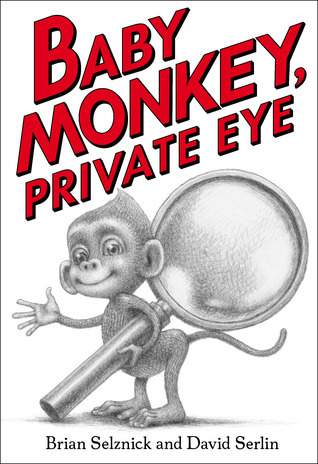 Let us know what’s wrong with this preview of Baby Monkey, Private Eye by Brian Selznick. Baby Monkey's adventures come to life in a blend of picture book, beginning reader, and graphic novel. To ask other readers questions about Baby Monkey, Private Eye, please sign up. Is this book appropriate for 5-year-olds? Mandy Laferriere My five year old LOVES this book, and he's pretty picky. The words are very large print, and he's really enjoying trying to read this on his own. Now look, it was all well and good when you started getting a little crazy and shaking up notions of what an “illustrated book” actually means. Winning the Caldecott for a novel? Never been done before. And the fact that Hugo Cabret and its companion novels Wonderstruck and The Marvels push every conceivable envelope, in terms of what a visual novel can be, is not just noteworthy but historic. But now you’re getting all slick on us. It wasn’t enough to c Brian Selznick. Honey. We’ve got to talk. Have a seat. I need to tell you a story. About three years ago I got wrapped up in a wave of hubris that almost knocked me flat. I had been suggested by an academic friend to contribute a chapter to a Routledge resource on picture books. Please bear in mind that I have almost no experience with academia in any form. Blithely I agreed and was subsequently floored when it became eminently clear that I was in over my head. My assigned chapter was “Picturebooks and Illustrated Books”, a distinction that I wasn’t overly familiar with. It all worked out in the end (thanks to the intervention of a friend who knew this territory better than I) and I got a crash course in the difference between an “illustrated book” and a “picture book”. Would that Baby Monkey, Private Eye had been available when I was determining these distinctions. As it turns out, there is a very good reason that press for this book calls it “a winning new format”. I'll break it down for you. The art is all what you expect of a Brian Selznick book. It's fantastic. The story is repetitive and good, not as great as I have come to expect from Brian. Baby Monkey is a detective and he solves cases really well. The thing is, each chapter is a case and they are all the same accept who did it and the pictures in the room. It's fun to see the differences. Still, there isn't much of a story here, not like even his novels before Hugo Cabret. A beginning reader could easily read this for themselv The art is all what you expect of a Brian Selznick book. It's fantastic. The story is repetitive and good, not as great as I have come to expect from Brian. Baby Monkey is a detective and he solves cases really well. The thing is, each chapter is a case and they are all the same accept who did it and the pictures in the room. It's fun to see the differences. Still, there isn't much of a story here, not like even his novels before Hugo Cabret. A beginning reader could easily read this for themselves and probably really enjoy it. I did enjoy the story, but I have a higher standard for Brian Selznick. It's a good book, it's not an amazing book for me. Each year my family reads all the Goodreads-award-nominated picture books. This is book #13 (of 20) of 2018, an early reader (grades 1-4) by the author of The Invention of Hugo Cabret and other middle grade graphic novels. We really liked this book a lot! It features a baby money who is a private eye. It's a first chapter book with few words and Selznick's typically breathtaking drawings. It's also a mystery short story collection, teaching people to pay attention to clues in the backgrounds (as Each year my family reads all the Goodreads-award-nominated picture books. This is book #13 (of 20) of 2018, an early reader (grades 1-4) by the author of The Invention of Hugo Cabret and other middle grade graphic novels. We really liked this book a lot! It features a baby money who is a private eye. It's a first chapter book with few words and Selznick's typically breathtaking drawings. It's also a mystery short story collection, teaching people to pay attention to clues in the backgrounds (as in books like Where's Waldo?). Some of the clues are actually ones adults would only know, but that's okay, because an adult would read an early chapter hooklike this with a child for the first time, at least. It's not a social justice book, it's a fun book, that also teaches genre at a very early age. Tara and I say 5 stars, but I'll rate down because of the three lower kid ratings. Hank (12): 4 stars. Cute! Harry (13): 4 stars. I like the key to baby monkey's office. Tara: 5 stars for the drawings. That's a cute monkey. I like the clues in the pictures framed on the walls. As an elementary school librarian, reading teacher, and a parent of a 6-year-old (and several older kids who were once 6), I'll tell you why this book is fabulous: because ALL kindergarten and first graders want in the whole entire world is to be able to check out and read a BIG BOOK. They want one just like the big kids get. The thick ones. With chapters. That's why Selznick's other books are so hot - BIG THICK BOOKS that all kids can experience. BUT. We keep talking Good Fit Books this and Good As an elementary school librarian, reading teacher, and a parent of a 6-year-old (and several older kids who were once 6), I'll tell you why this book is fabulous: because ALL kindergarten and first graders want in the whole entire world is to be able to check out and read a BIG BOOK. They want one just like the big kids get. The thick ones. With chapters. That's why Selznick's other books are so hot - BIG THICK BOOKS that all kids can experience. BUT. We keep talking Good Fit Books this and Good Fit Books that. Blah blah blah. WELL, this is it. It's big. It's thick. It has tons of pages. BUT. THEY CAN READ IT! I field tested it with my 6 yo daughter last night and she LOVED it. She figured out all the picture clues and was able to read multiple sections to me. And as an adult, it's just plain adorable. The majority of "early readers" are either 1) incredibly little/skinny or 2) not actually for the earliest readers. So many of the new early chapter books are actually written at an upper 2nd/3rd grade reading level.......fine for them, but not for actual beginning readers! I will be buying multiple copies of this book for my library and anticipate it never being on the shelf. This book pretty much had me at the title. I mean come on!!! A Private Eye monkey. Brilliant! Heavy, smooth, cool to the touch pages with big, easy words and dazzlingly detailed, black & white (with dashes of red) illustrations come together to form Baby Monkey, Private Eye. I knew this book was supposed to be a blend of picture book and easy reader styles, but I was surprised and honestly a little disappointed with the simplicity here. On one hand, it was a cute story with repeating steps to read and giggle at. And on the other hand, I did finish it and ask--That's it? I was hoping for a wee bit more hunting for clues--certainly more than our hero walking out the door and finding the culprit right there on the next page. *shrugs* A little more investigating would have been fun. Check it out from your local Library. This book makes my heart happy - on so many levels. In this very early chapter book, Selznick fuses his trademark cross hatched pencil sketches with addictively repetitive picture book text in a middle grade novel trim size. Still with me? We learn who Baby Monkey is (a baby monkey) and that he has crimes to solve in a particular way, mainly, by looking for clues, writing notes, struggling mightily to put on his pants, and then immediately capturing the culprit. The pictures are adorable, the text (which is in about a 50 point font)is simple, and the final case endearing to the very young who still want to snuggle with their mamas. Strengths: Very cute, well done, and introduces the film noir detective style to toddlers. The notes at the back of the book about the details in the pictures for each case were incredibly detailed and pertinent to the content. Weaknesses: Falls firmly on the elementary side of the Pilkey Line. Baby Monkey is quite the sleuth when it comes to solving crimes, although he’s not so hot at putting on his pants. The artwork of Brian Selznick (The Invention of Hugo Cabret, Wonderstruck) and stories by Selznick and David Serlin make this early reader book a giggle-inducing winner with its quirky pictures and large, easy-to-read text. Readers with some background knowledge will enjoy figuring out why the artifacts in Baby Monkey’s office change to fit the crime under investigation, although th Baby Monkey is quite the sleuth when it comes to solving crimes, although he’s not so hot at putting on his pants. The artwork of Brian Selznick (The Invention of Hugo Cabret, Wonderstruck) and stories by Selznick and David Serlin make this early reader book a giggle-inducing winner with its quirky pictures and large, easy-to-read text. Readers with some background knowledge will enjoy figuring out why the artifacts in Baby Monkey’s office change to fit the crime under investigation, although the back matter explains it all. Downloadable coloring pages and other activities are available from Scholastic here. This is a brilliant mash-up of picture and chapter book. The illustrations are more frequent than words and were my favorite part. Marketed to ages 3-8, this book would be a great group read to children almost ready to read and a great choice for beginning readers. The repetition of text means fewer words for young children to memorize. It al Cute, funny, easy reader with awesome illustrations. Baby Monkey, Private Eye contains five cases for Baby Monkey, who is of course a baby monkey, to solve. If you've ever looked for a combo of picture book, easy reader, chapter book, graphic novel, humor-mystery, this is your book. It's almost too many things, but the experience of reading it with my four-and-a-half year old was definitely five stars. The text is super simple and repetitive. The illustrations are almost colorless, but very detailed. As in other books by Selznick, the text and illustrations both carry a lot of story weight. Crowning moment of the whole thing: when my child took the b If you've ever looked for a combo of picture book, easy reader, chapter book, graphic novel, humor-mystery, this is your book. It's almost too many things, but the experience of reading it with my four-and-a-half year old was definitely five stars. Kind of adorable! I liked it but didn't love it. As a bookseller I'm not sure who I'll give this book to but I'll know them when I see them. I have read this to three classes (Kindergarten and first grade) and they were over the moon about it. The hand at the door, the tracks, the pants, they loved it all. This is kind of random, but the book before my last one also had Monkey in the title, and I liked it even less than this. Perhaps there's an embedded message? Cute illustrations, as always in a Brian Selznick book, but this one did not work for me. Great premise: a baby monkey private detective. But, much of his cleverness is not shared with readers. Five clients come to his office to help find something stolen, and he solves the crimes one by one. But, we don't know how. Kind of disappointing ac This is kind of random, but the book before my last one also had Monkey in the title, and I liked it even less than this. Perhaps there's an embedded message? With a film noir vibe, minimal text, appealing plot repetition, and a few snack breaks along the way, this brilliant blend of early reader and picture book introduces one seriously adorable, wardrobe-challenged detective, Baby Monkey, who is quite the accomplished crime solver. The pants! The snacks! The scene shifts! The criminals! Kids will appreciate the easy font and gorgeous, classically Selznick pencil sketches. Astute parents will chuckle at the clues hidden in each office scene (and thos With a film noir vibe, minimal text, appealing plot repetition, and a few snack breaks along the way, this brilliant blend of early reader and picture book introduces one seriously adorable, wardrobe-challenged detective, Baby Monkey, who is quite the accomplished crime solver. The pants! The snacks! The scene shifts! The criminals! Superb illustrations but weak on the storytelling. This is damn near 5 stars. It absolutely stole my heart before we even got to the contents. A wonderful beginning reader that may look a little intimidating but will sit just right. Screaming WAIT! is my favorite, much as it is in I Am Invited to a Party! (Elephant and Piggie). Funny text, delightful illustrations that you expect from Selznick, and a super snuggly ending. An unexpected key, index, and bibliography for curious readers. A must have for public and school libraries. Perfect for a kid This is damn near 5 stars. It absolutely stole my heart before we even got to the contents. A wonderful beginning reader that may look a little intimidating but will sit just right. Screaming WAIT! is my favorite, much as it is in I Am Invited to a Party! (Elephant and Piggie). Funny text, delightful illustrations that you expect from Selznick, and a super snuggly ending. An unexpected key, index, and bibliography for curious readers. This is delightful and cute! And educational, but sneakily so. It's a Baby! It's a Monkey! It'a Baby Monkey Private Eye! He solves crimes (maybe with his ESP?? ), eats snacks, and puts on pants. He has a routine and he never deviates - that's how he came to be a crack detective! Lovely work for early readers with his signature art styl This is delightful and cute! And educational, but sneakily so. what a fun beginning reader book with the beautiful illustrations of Brian Selznick! Brian Selznick is one of my favorite authors. His new book about Baby Monkey doesn't disappoint. Abound with his gorgeous illustrations, readers of any age will enjoy this one. This is a deceptive little book for very early readers. Follow the case files of Baby Monkey as puts an end to the crime wave that has struck. As with any Selznick book the pictures are part of the narrative. This is an important feature of this books, as it asks the early reader to stay with page a little longer, enforcing early literacy skills, with or without your pants. addendum: I read this at work, laughed, aww-ed, just a bit, and then wrote the review and then....I saw the index!!! And the This is a deceptive little book for very early readers. Follow the case files of Baby Monkey as puts an end to the crime wave that has struck. As with any Selznick book the pictures are part of the narrative. This is an important feature of this books, as it asks the early reader to stay with page a little longer, enforcing early literacy skills, with or without your pants. It's hard to find a place for this book. It's an interesting format that has picture book qualities, but is broken up into chapters like juvenile fiction. BUT defining the book is neither here nor there, what is important is reading the book. I cannot even begin to tell you how much I loved this book. I got the goofiest grin reading this book. The number of ways Baby Monkey can put his pants on wrong is impressive and hilarious. The number of ways Selznick changes up the office each time a new ch It's hard to find a place for this book. It's an interesting format that has picture book qualities, but is broken up into chapters like juvenile fiction. BUT defining the book is neither here nor there, what is important is reading the book. I cannot even begin to tell you how much I loved this book. I got the goofiest grin reading this book. The number of ways Baby Monkey can put his pants on wrong is impressive and hilarious. The number of ways Selznick changes up the office each time a new chapter begins is pure genius. I had to go back and re-read the book a second time just to find all the nuances in the drawings. I received a copy of this ARC through a Goodreads giveaway. I like that the text is simple and repetitive. It could be enjoyed by any age reader. What I LOVE about the book are the illustrations, particularly how in each chapter the detective office decorations change and are connected to the mystery. A curious reader will recognize and enjoy these details. I liked that Selznick and Serlin included a list of things to notice at the end of the book. I will share with a younger student who is lovin I received a copy of this ARC through a Goodreads giveaway.